Image: the steep path down into the biggest chamber called Leissnerdom. Open: APR-OCT Tue-Sat 10-17, tours on the full hour, Sun 9-18. Fee: Adults EUR 2,40, Children EUR 1,60. Groups (20+): Adults EUR 2,10, Children EUR 1,30. Guided tours: L=700m, D=30min, V=20,000/a [200?]. 1596 Windloch (Wind Hole) first time mentioned. 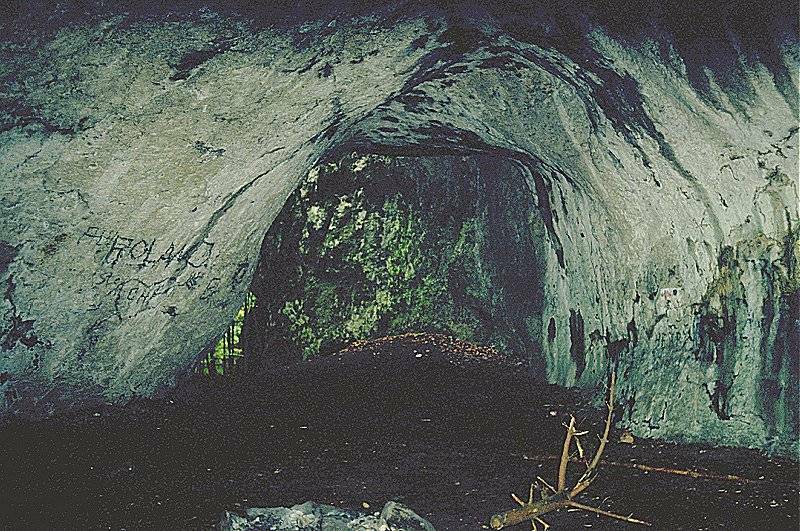 1597 first exploration of the cave on the search for gold. 1703 after a battle on the 24-MAY, 28 casualties were thrown into the Windloch. 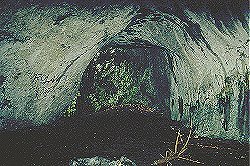 1833 a insane woman falls into the cave and is rescued after five days. 1852 exploration and opening of the modern entrance. 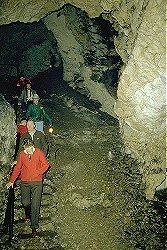 Renamed into Deutsche Douglashöhle (German Douglas Cave). 1853 opened for the public. 1878 start of guided tours. 1901 discovery of the Großer See (Great Lake). 1926 additional development works and opening of the current cave exit. Image: a nice formation in a side passage. The old entrance of the Maximiliansgrotte is the so called Windloch (Wind Hole), a 27m deep pit, which was formed by the caving in of the Leissnerdom. Until 1852 the cave was called Windloch am Zinnberg. Then it was renamed several times, first to Deutsche Douglashöhle, then to Wunderhöhle or Wundershöhle (Wonder Cave). The final name Maximiliansgrotte was given to the cave to honor King Max II. of Bavaria. 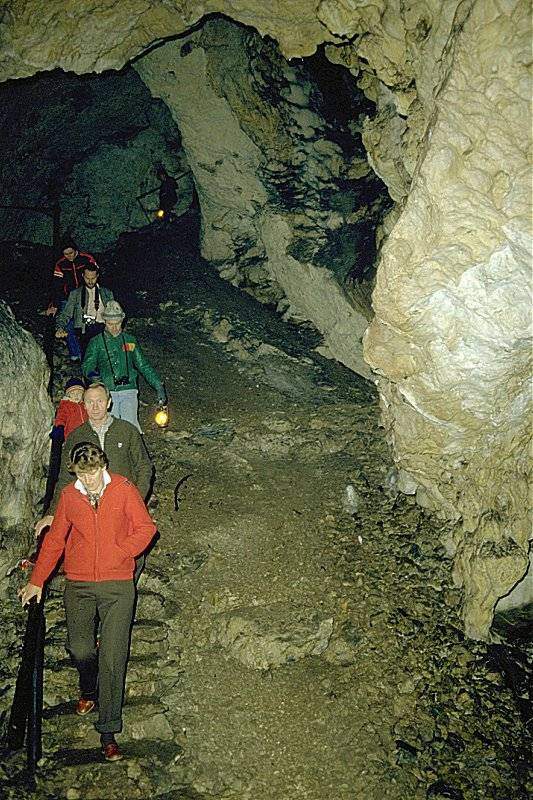 But the locals still call it Krottenseer Höhle (Cave of Krottensee). 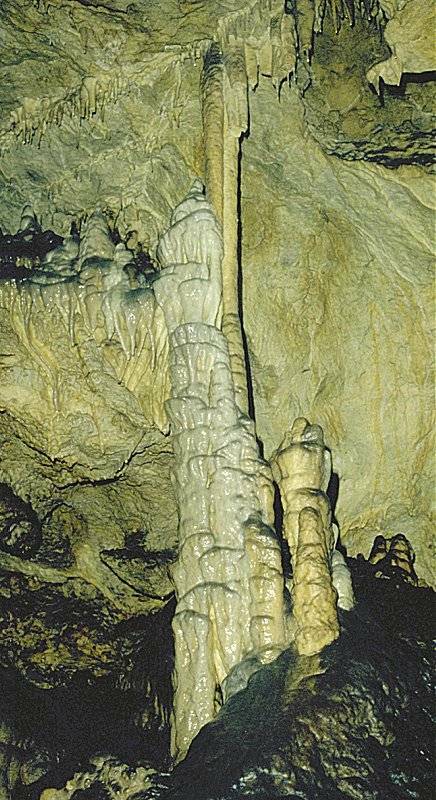 The most impressive speleothem of the cave is the Eisberg (Iceberg), a stalagmite 6m high and 3m wide. But the cave has numerous speleothems including Helictites and Moonmilk. During excavatios, potsherds from the Hallstatt age and remains of human bones were found. The bones were much younger and were from soldiers which died in the War of the Spanish Succession (1701-1714) in the battle at Krottensee on 24-MAY-1703. After the battle the corpses were thrown into the Windloch. The parking of the cave, located in the forest near Krottensee, is the start of several karst trails. The trails lead to caves, dolines and rock formations in the area. Most impressive is the huge Vogelherdhöhle. This big through cave is the last remain of a cave system, which obviously had impressive dimensions. Another sight is the Steinerne Stadt (Rock City) which is 1.5km fom the parking. This is the eroded remains of a coral reef. The nearby Weissingkuppe also shows impressive doloite rock formation. Outstanding is a huge rock with a diameter of at least 5m, which stands on a foot of only 80cm diameter!